395 Commonwealth is located on the north side of Commonwealth, between Massachusetts Avenue and Charlesgate East, with 393 Commonwealth to the east and 397 Commonwealth to the west. 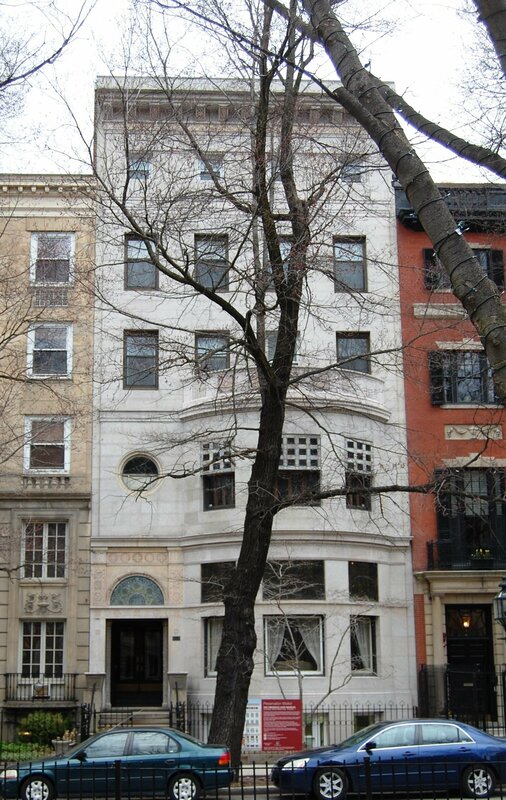 395 Commonwealth was designed by architect Alfred J. Manning and designer Louis Comfort Tiffany, and built in 1899-1900 for Frederick Ayer and his wife Ellen Barrows (Banning) Ayer. He is shown as the owner on the original building permit application, dated December 9, 1899, and on a second application to build a one-story storage building in the rear, dated November 19, 1900. 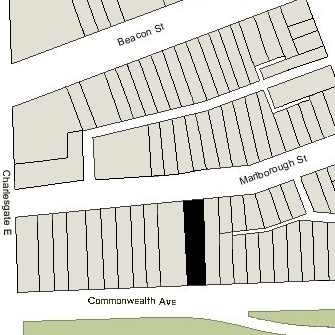 The rear of the lot on which 395 Commonwealth was built extends north to Marlborough Street and has a secondary street address of 444 Marlborough. The original building permit application names only Alfred J. Manning as the architect. However, much of the interior was designed by Louis Comfort Tiffany, the noted artist, interior designer, and master of stained glass. He also collaborated with A. J. Manning on the exterior. A December 21, 1901, article in the American Architect and Building News notes: “In carrying out his design the architect had the benefit of association with Mr. Louis C. Tiffany, who designed the exterior mosaic-work, which makes the house so notable on a Boston street, as well as decorated the interesting main staircase…”. Frederick Ayer purchased the land for 395 Commonwealth on April 15, 1899, from real estate dealer Frederick O. Woodruff, a 52 foot wide lot to the east and a 26 foot wide lot to the west. On January 17, 1901, after 395 Commonwealth had been built on a 31.97 foot wide lot, he sold the remaining vacant lot, with a frontage of 46.03 feet, to Alexander Agassiz. Frederick Woodruff had acquired the two lots on the same day he conveyed them to Frederick Ayer, the 52 foot wide lot from S. Endicott Peabody and the 26 foot wide lot from the estate of William G. Saltonstall. S. Endicott Peabody and William G. Saltonstall had purchased their lots in January of 1886 from a real estate investment trust formed by Francis A. Palfrey, Francis A. Osborn, and Grenville T. W. Braman, both lots being part of a tract of land the trust had purchased on June 1, 1880, from the Boston Water Power Company. When the trustees sold the lots to S. Endicott Peabody and William Saltonstall, they included language prohibiting the use of any building on the land as a stable and prohibiting the erection of any building of more than one story in height within thirty feet of Marlborough. When Frederick Ayer sold the vacant lot at 397 Commonwealth to Alexander Agassiz, he included additional language (for Alexander Agassiz’s benefit) specifying that no building in the rear of 395 Commonwealth could be located within 8 feet of the boundary line with 397 Commonwealth. Click here for an index to the deeds for 395 Commonwealth, and click here for further information on the land west of Massachusetts Avenue between the south side of Beacon and the north side of Commonwealth. By the 1900-1901 winter season, Frederick Ayer and Ellen (Banning) Ayer had made 395 Commonwealth their home. They previously had lived at 232 Beacon and in Lowell. They also maintained a home, Avalon, at Prides Crossing. Frederick Ayer began his business career as a manufacturer of patent medicines in partnership with his brother, Dr. James C. Ayer. He subsequently entered the textile manufacturing business in Lowell and Lawrence, and, with his son-in-law, William Madison Wood, founded the American Woolen Company. William Wood was the husband of Ellen Wheaton (Ayer) Wood, Frederick Ayer’s daughter with his first wife, Cornelia (Wheaton) Ayer, who died in January of 1878. 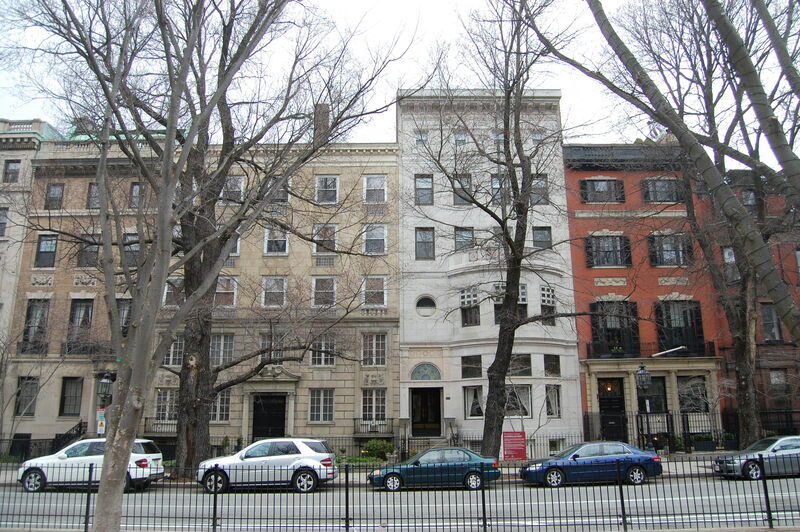 Frederick and Ellen Ayer’s three children lived with them: Beatrice Banning Ayer, Frederick Ayer, Jr., and Mary Katharine (Kate) Ayer. Beatrice Ayer married in May of 1910 to George Smith Patton, Jr., a lieutenant in the US Army who would become a noted general in World War II. After their marriage, they moved to Fort Sheridan, Illinois, where he was stationed. Frederick Ayer, Jr., a trustee, married in August of 1914 to Hilda Proctor Rice and moved to Topsfield. Mary Katharine Ayer married in May of 1917 to Keith Merrill, a lawyer in Minneapolis. Frederick Ayer died in March of 1918 and Ellen Ayer died the next month, in April of 1918. On September 15, 1923, 395 Commonwealth was acquired from Frederick Ayer’s estate by Ethel Josephine (Hixon) Abbott, the wife of Charles Edward Abbott. He was president of the E. A. Abbott Company (founded by his father, Edward A. Abbott), office building contractors, which subsequently converted 395 Commonwealth into offices. On January 23, 1925, 395 Commonwealth was acquired from Ethel Abbott by the Professional Building Company. The company had been formed by Charles Abbott to purchase the Hotel Tuileries at 270 Commonwealth in August of 1921, which it subsequently converted into medical offices and continued to own. On August 22, 1930, 395 Commonwealth was acquired from the Professional Building Company (Huntington P. Faxon, president, and Charles W. Greenough, treasurer) by real estate dealer James M, Burr; it was acquired from him on November 6, 1930, by John Matheson. It continued to be medical offices. 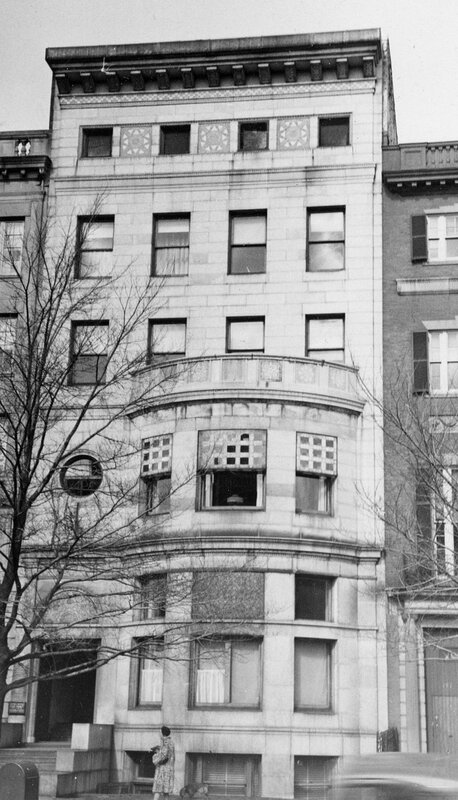 On February 4, 1939, Brookline Savings Bank foreclosed on a mortgage it held on 395 Commonwealth and took possession of the property. 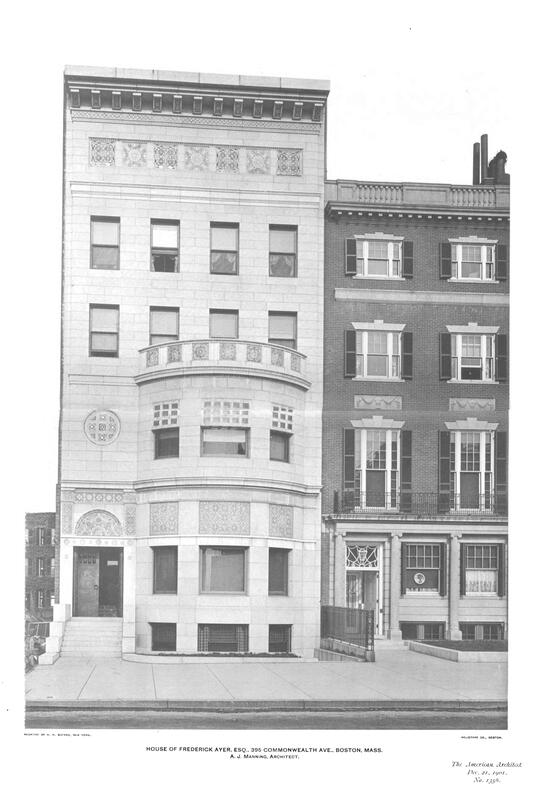 On December 30, 1943, 395 Commonwealth was acquired from the bank by Francis J. Quinn of Cambridge. The property subsequently changed hands and on May 3, 1946, was acquired by Max J. Rothbard, a shoe manufacturer. He and his wife, Ida (Poitras) Rothbard, lived in Swampscott. Max Rothbard died in November of 1947. On August 31, 1951, 395 Commonwealth was acquired from Max Rothbard’s estate by Massachusetts Properties, Inc. (Samuel Lipsky, president, and Benjamin Lipsky, treasurer). It remained a medical office building. 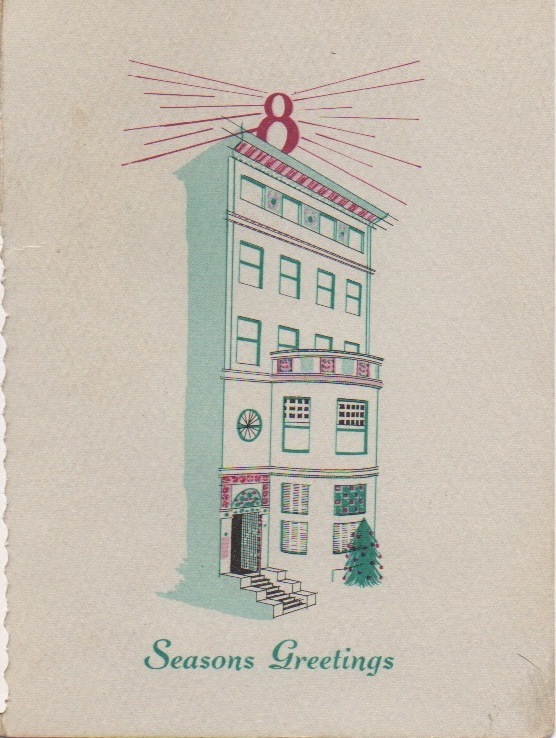 On January 9, 1953, 395 Commonwealth was acquired from Massachusetts Properties by the Hearthstone Insurance Company of Massachusetts, which moved its offices there from 120 Boylston. For several years, it also continued to lease offices to doctors, dentists, and others. In January of 1958, Hearthstone Insurance acquired 397 Commonwealth from the Boston Evening Clinic. Thereafter, it operated the two properties as a single building, the Hearthstone Building. In addition to maintaining its offices there, it leased space to other businesses, among them the Frick Company, dealers in refrigerators, and the Paul L. Beane Company, food brokers. An affiliate of the Roman Catholic Opus Dei organization, the Association for Cultural Interchange opened a dormitory and cultural center for women students, Bayridge Residence, at 395-397 Commonwealth. In April of 2005, 395 Commonwealth was designated a National Historic Landmark in recognition of its standing as one of only three surviving examples of residential interiors designed by Louis Comfort Tiffany, and the sole example of an interior designed by him at the time the building was built, rather than as part of a remodeling. 395-397 Commonwealth remained the Bayside Residence and Cultural Center in 2018, with the original 395 Commonwealth, the Ayer Mansion, open for public tours, lectures, and events, under the auspices of the Campaign for the Ayer Mansion, Inc., formed in 1998 to preserve the building.